Break the chocolate into pieces and drop into a food processor. Process for 1 minute, or until just a few pieces remain in the otherwise powdery chocolate. Alternatively you can finely grate the chocolate. Measure the sugar and 6 tablespoons of water into a small pan and heat gently over a low heat, until the sugar has dissolved, stirring occasionally. Turn up the heat and boil briskly for 3-4 minutes until it becomes a thin syrup. Set the processor running and pour in the hot syrup through the funnel onto the chocolate so it melts and becomes liquid. Add 2 tablespoons of boiling water. Next add the egg yolks and process for a few seconds before adding the brandy. If you are not using a processor, beat the ingredients together. In a separate bowl beat the cream to a soft floppy consistency then fold in the chocolate mixture. Spread in a 20cm loose-bottomed or springform tin lined with cling film, levelling the top with the back of a spoon. Cover with clingfilm and transfer to the freezer for a minimum of 4 hours to freeze. To serve, remove from the freezer, release from the tin and transfer to a plate. 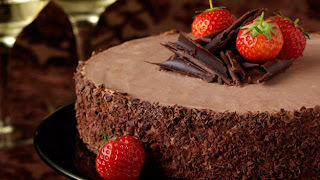 Decorate with the icing sugar, strawberries and grated chocolate. Allow to soften a little and serve about 10-15 minutes after coming out of the freezer.